The U.S. ran a $71.6 billion Goods Trade Deficit in December, the largest goods deficit since July 2008’s $76.88 billion. The U.S. likely accumulated a near $550 billion Current Account Deficit in 2017, also near the biggest since before the crisis. Going all the way back to 1982, the U.S. has posted only two quarterly surpluses (Q1, Q2 1991) in the Current Account. Since 1990, the U.S has run cumulative Current Account Deficits of $10.177 TN. From the Fed’s Z.1 report, Rest of World holdings of U.S. financial asset began the nineties at $1.738 TN; closed out 2008 at $13.699 TN; and ended Q3 2017 at $26.347 TN. It’s gone rather parabolic – with a curiously similar trajectory to equities markets. For better than three decades, the U.S. has been in an enviable position of trading new financial claims for foreign manufactured goods. The U.S. has literally flooded the world with dollar balances. In the process, the U.S. exported Credit Bubble Dynamics (including financial innovation and central bank doctrine) to the world. When the central bank to the world’s reserve currency actively inflates, the entire world is welcome to inflate. The resulting global monetary disorder ensured a world of fundamentally vulnerable currencies. Despite unrelenting Current Account Deficits, there have been two distinct “king dollar” episodes. There was the “king dollar” period of the late-nineties, fueled by global financial instability, a U.S. edge in technology and, importantly, the Greenspan Fed’s competitive advantage in sustaining U.S. securities markets inflation. More recently, a resurgent “king dollar” was winning by default in 2013-2016, as the ECB, BOJ and others implemented massive “whatever it takes” QE and rate programs. Moreover, the shale revolution and a dramatic reduction in oil imports was to improve the U.S. trade position. Oil imports did shrink dramatically, but this was easily offset by American consumers’ insatiable appetite for imported goods. It’s an intriguing case of parallel analytical universes. There’s the bullish – U.S. as the world’s invincible superpower – view. America is blessed with superior systems – economic, governmental, market and technological. The world’s best and brightest still yearn to come to the land of opportunity. And with a few notable exceptions, this view has received almost constant affirmation from booming equities, debt securities and asset markets. Robust bond markets, in particular, ensured insatiable international demand for dollars. Surely, concern for U.S. Trade and Current Account Deficits is archaic, at best. The opposing view holds that the U.S. financial situation is unsound and untenable. A deindustrialized “services” and finance-based economy is dependent upon unending Credit expansion, with the vast majority of new Credit non-productive in nature. The U.S. boom is again financed by unsound leveraging, this time generated chiefly by global central banks and foreign-sourced speculative finance. The perpetual outflow of U.S. currency balances internationally ensures at some point a crisis of confidence in the dollar. What’s more, extreme monetary inflation by the other major central banks since 2012 only increases the likelihood of a more systemic crisis of confidence throughout global markets and currencies. The resulting unprecedented looseness in global monetary conditions over recent years has promoted a degree and scope of excess sufficient for a deep and prolonged global crisis. It’s been my long-hold expectation that the world at some point would discipline U.S. profligacy. The world instead followed in our footsteps. Global central banks accommodated unfettered finance, adopted inflationism and, without protest, recycled trade surpluses right back into U.S. financial markets. There was Greenspan’s “conundrum” and Bernanke’s “global savings glut.” The reality is that U.S. trade deficits have been at the heart of a runaway expansion of market-based finance around the world. This dysfunctional and precarious financial backdrop was interrupted temporarily in 2008. Zero/negative rates along with $14 TN (and counting) of central bank liquidity fueled a much more systemic Bubble of unprecedented dimensions. Importantly, central bankers came together to support a common goal: reflation of markets and economies. Concerted policymaking – from Washington to Ottawa, London, Frankfurt, Zurich, Tokyo, Sydney, Beijing and beyond – has been fundamental to the synchronized global surge in risk-taking, over-liquefied market Bubbles and economic recovery. After the dramatic cut in corporate tax rates and myriad measures seen as benefiting the wealthy, some argue that Trump populism is a ruse. But now we see a 2018 push on tariffs, aggressive trade negotiation, U.S. capital investment and higher wages meant to rebuild our manufacturing base to the benefit of the American worker. Rather than the rich continuing to build wealth at the expense of the lowly worker, they can now grow wealth together. Is such a radical change even possible? Where are the losers? Surprisingly candid comments from our Treasury Secretary. And as much as he, the President and other administration officials work to “walk back” Wednesday’s comment, “obviously a weaker dollar is good for us” confirms what many had suspected. “America First” has a “beggar-thy-neighbor” currency devaluation component. A revitalized U.S. manufacturing sector will come at the expense of our trade partners and the holders of our debt. I’ve posited in past CBBs that it would have been easier to implement the Trump agenda in a crisis backdrop. This requires revision: it would have been less risky to implement… Huge tax cuts at this late stage in the Bubble come with unexpected consequences, including those associated with stoking acutely speculative risk markets. There are major risks in feeding an investment boom now, following years of extraordinarily loose financial conditions and today’s 4.1% unemployment rate. It’s reckless running huge fiscal deficits at this late stage of a boom cycle – with federal debt having already inflated from $6.074 TN to $16.463 TN in less than ten years. And, this week, openly lauding the benefits of a weaker dollar with foreign holdings of U.S. debt securities at $11.370 TN (up 57% since the crisis!). Mario Draghi’s rebuke was as swift as it was stern. The ECB’s Maestro well-appreciates that Mnuchin and the Trump folks are playing with fire. Global central bankers in concert have cultivated the perception that everything is well under control. No need to fret market liquidity, at least not in equities and bond markets. Currencies, well, that’s a whole different animal. There are few matters that keep central bankers awake at night like the prospect of dislocation in the currency markets. These are massive markets, generally well-behaved but not easily controlled when they’re not. Disorderly selling of the dollar – with all the leveraged currency trades and unfathomable derivative exposures that have accumulated for decades and mushroomed since the crisis - now that’s lush habitat for the proverbial black swan. The Dow gained another 545 points this week, bring 2018 gains (17 sessions) to 1,897 points. The S&P500 jumped 2.2%, as the dollar index declined 1.7%. Clearly, U.S. and global risk markets are fine with dollar devaluation. Heck, they’re delighted with the notion of concerted global currency devaluation. The sickly dollar will only pressure the ECB, BOJ and others to stay looser for even longer. What country these days feels comfortable with a strong currency? What could go wrong? Does dollar weakness and attendant securities market froth pressure the Fed to pick up the pace of rate increases? Heaven forbid, might they actually come to the realization that they need to actually tighten monetary conditions. Beyond stock market Bubbles, the weakening dollar bolsters the case for an uptick in inflationary pressures. WTI crude is up a quick 9.5% y-t-d to $66.14. The GSCI commodities index has gained 4.7% in the first four weeks of the year. Heightened dollar vulnerability might also engender a consensus view within the global central bank community supportive of tighter U.S. monetary policy. “Beggar-thy-neighbor” – not desperate depression-era measures, but amid economic/financial boom and record stock prices. Uncharted territory. Trapped in concerted reflationary monetary policymaking, global central bankers may be tempted to disregard ramifications of “America First.” This will unlikely be the case with foreign governments. And when do anxious governments begin to pressure their central banks against accommodating Team Trump ambitions? Beijing has already reminded the world of their prerogative to liquidate China’s Treasury hoard. Global markets remain confident that central banks have no option other than recycling dollars back into U.S. securities markets. Perhaps this is too complacent. Crisis-period QE and zero rates evolved over years into “whatever it takes” open-ended QE, negative rates and egregious market manipulation. Global central bankers took control – and today have things fully under control. This market perception has been instrumental in the historic collapse in market volatility. Resulting readily available cheap market risk protection has incentivized historic risk-taking and today’s speculative melt-up market dynamic. Historians may look back at Team Trump’s jaunt to chilly Davos as a pivotal juncture in global finance. Was it naivety, gall or a combination – or just typical of today’s overabundance of complacency? The U.S. Treasury Secretary - facing enormous fiscal deficits, rising rates, $16.5 TN of federal debt, a nervous bond market and suspicious foreign officials - openly advocating a weaker dollar. There are certainly plenty of dollars in the world available to sell or hedge. What is the likelihood of dollar selling turning disorderly? One might look at several years of incredible ECB and BOJ “whatever it takes” liquidity creation and rate suppression (and interest-rate differentials you could drive a truck through) and ponder Friday’s closing prices of 1.24 for the euro and 108.58 for the dollar/yen. Those are two flashing warning signs of dollar vulnerability. In all the euphoria, markets can be excused for presuming dollar weakness ensures a further delay in global rate normalization. Yet things turn quite interesting the day unruly currency markets begin indicating disorderly trading. The almighty central bankers might have little to offer. What if they intervene to no avail? This could prove the juncture when markets begin questioning the Indomitable Central Banks in Control thesis. The price of market “insurance” would begin to creep (or, not unlikely, spike) higher, and the availability of cheap risk protection would wane (possibly abruptly). In such a development, I would expect the more sophisticated market operators to begin (aggressively) pulling back on risk and leverage. Such a dynamic, especially after such a spectacular melt-up, would mark an important inflection point for market liquidity. Ten-year Treasury yields were little changed on the week at 2.66%. Yet two-year yields rose five bps to 2.12% and five-year yields rose two bps to 2.47%. Global yields are on the move. German 10-year yields jumped six bps to a 13-month high 0.63%, and French yields gained seven bps to 0.91%. UK yields jumped 11 bps to 1.44%. The dollar’s worst start to a year since 1987. Wildly speculative stock markets, rising bond yields, Fed rate hikes, dollar weakness and acrimony, and general currency market instability. Today’s backdrop recalls 1987, though with some important differences. The world has so much more debt these days. Global equities markets are so much bigger and interconnected – derivatives markets incredibly so. Did China even have a stock market in ’87? Today’s central bank balance sheets would be unimaginable back in 1987. Markets certainly had much less faith in central bank liquidity backstops. 1987 had this exciting new financial product, “portfolio insurance.” 2017 has the continuation of this enchanting New Age notion that central banks insure all portfolios. The Great Irony of Contemporary Finance: years of extreme central bank inflationary measures ensured that global finance outgrew the capacity of central bank liquidity backstops. HEDGE-FUND managers may be feeling quietly smug about their performance in 2017. They returned 6.5% on average, according to Hedge Fund Research, a data provider, their best year since 2013. But those returns do not really suggest that they are masters of the investing universe. The S&P 500 index, America’s main equity benchmark, returned 21.8%, including dividends, last year. More tellingly, a portfolio split 60-40 between the S&P 500 and a mixture of government and corporate bonds (an oft-used benchmark for institutional portfolios) would have returned 14.8%. Last year was the fifth in a row when hedge funds underperformed the 60/40 split (see chart). That ought to be a salutary lesson for those institutions who think that backing hedge funds is the answer to their prayers. Despite the highs recorded by stockmarkets, many employers are struggling to fund their final-salary pension promises. In 2016 the average American public-sector plan was just 68%-funded, according to the Centre for Retirement Research at Boston College. In the private sector, multi-employer pension plans, covering workers in industries like mining and transport, have liabilities of $67.3bn and assets of just $2.2bn. Worse still, the insurance scheme established to back those schemes is on course to run out of money by 2025, according to the Pension Benefit Guaranty Corporation. It is hard to cut workers’ benefits and painful to increase contributions. Schemes hope to square the circle by earning a high return from their assets; 7.5% is a common target. But bond yields are very low and equities are trading at very high valuations by historical standards. The temptation is to turn to “alternative assets”—a category that includes property, private equity and hedge funds. The first two offer a genuine alternative. Property generates a stream of rental income and the hope that capital values will keep pace with inflation. Private equity is, in part, a bet that unquoted firms can generate higher returns than listed ones because they have more freedom to invest for the long term. But what about hedge funds? A lot of funds specialise in equities or corporate bonds—the same assets that institutions own already. In some other categories, such as macro funds or merger arbitrage, returns are entirely dependent on the manager’s skill. Recent years do not suggest that hedge-fund managers display enough skill, on average, to offset their high fees. Clients may think they will be able to pick the best hedge-fund managers, not the average ones. But one group of professionals—fund-of-fund managers—tries to do just that. They did manage to pip the average asset-weighted return of hedge funds in 2017, but failed to do so in any of the previous four years. If the experts cannot manage to pick the winners, why should a pension fund or endowment be able to manage the feat? 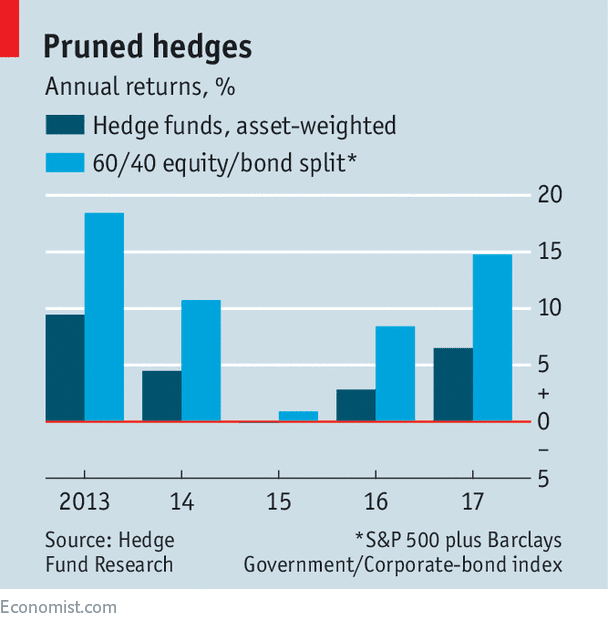 Another justification for placing money with hedge funds is that they are less likely to lose lots of money in a downturn. That argument was somewhat dented in 2008, when the average hedge fund lost 19%. In any case, pension funds and endowments are investing for the long term; they ought not to be that bothered by short-term volatility. The Centre for Retirement Research conducted a study* of the effect of investing in alternative-asset categories on state and local-government pension-plan returns in the 2005-15 period. It found that schemes that placed an extra 10% of their portfolio in private equity and property had marginally increased the return on their portfolios (by around a sixth of a percentage point). But investing in commodities or hedge funds had reduced returns, with the latter knocking half a percentage point off the total. Some investors have seen the light. CalPERS, a public-pension fund in California, announced that it was pulling out of hedge funds in 2014. But Preqin, an information provider, estimated last year that pension funds accounted for 42% of all money flowing into the global hedge-fund industry. North America provided the bulk of the money, with 776 pension schemes investing from that region alone. Who knows what those schemes are trying to achieve? A few of them may be lucky enough to pick the best performers in the industry. But if they think, in aggregate, that their strategy will reduce their funding deficits, then they are suffering from a delusion. Tax cuts are well and good, but the surest way to spur economic growth is to let in more people. As Congress and the Trump administration debate immigration reforms with important legal and social implications, they must not lose sight of an overarching truth: Robust immigration levels are vital to growing the American economy. 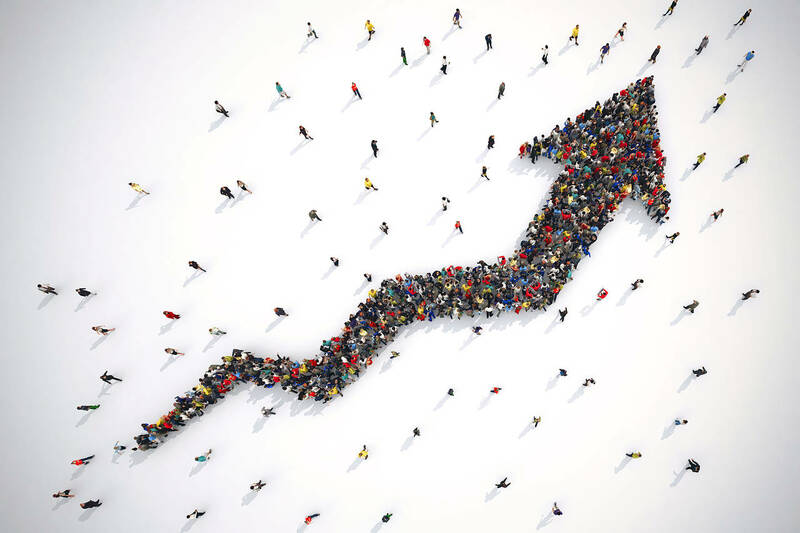 Legislators of both parties, policy makers and families all want faster economic growth because it produces more resources to fund national priorities and raise living standards. But growth since the end of the Great Recession has been frustratingly slow, averaging only 2.2% net of inflation, down from 3.6% on average from 1960 to 2000. Republicans hope the new tax cuts will lead the economy to grow faster. But while stimulus plans can indeed produce growth at least temporarily, they usually do so by increasing the deficit. Can’t policy makers achieve faster growth without further ballooning our national debt? Yes—and increasing immigration levels is the most reliable way to do so. Long-term economic growth comes from two sources: productivity growth and population growth. Productivity growth means the same number of workers are able to produce more goods and services. Increased productivity comes from better education (equipping workers with better skills) and technology development (giving workers more sophisticated tools). Productivity growth has been very low during this recovery, averaging only 1.1% per year, down from 2.1% from 1960 to 2000. We can’t predict whether productivity growth is going to return to prior levels on its own. Congress could decide to spend more on education or basic research to boost productivity, but it takes years for such investments to translate into a more productive economy. That doesn’t mean they aren’t worth making, but the payoffs are highly uncertain. Population growth drives economic growth because a larger population means more workers to produce things and more consumers to buy things. But as is true in most other advanced economies, Americans are having fewer children. The U.S. working-age population has stagnated over the past decade. Using public policy to increase the nation’s fertility rate is not easy. Congress could try to create economic incentives for families to have more children by offering tax credits and free child care, but both would be expensive and take years to move the needle on population growth. The surest way to increase the working-age population is through immigration. Immigration has boosted U.S. economic growth throughout history and can continue to do so if the country remains committed to openness and opportunity. Some immigration opponents fear immigrants will compete with native-born Americans for jobs, but the bulk of economic research shows immigration has led to faster overall growth and a higher per capita standard of living. There is a global competition for talent among countries to lure workers, including highly skilled workers to develop new technologies and lower-skilled workers to support agriculture. This is a competition America has won resoundingly decade after decade. My parents, who immigrated from India, and my wife, who immigrated from the Philippines, are examples. They came to finish their education but stayed because of America’s welcoming culture and strong job prospects. Given the choice of immigrating here or to virtually any other country, the majority of immigrants would choose the U.S. Immigrant inflows to the U.S. are relatively low by postwar standards. If Congress and the administration can deliver reforms that boost legal immigration by one million people a year and tailor the policy to prioritize workers who meet the needs of our economy, the Minneapolis Fed estimates growth would increase by at least 0.5 percentage point a year under the most conservative assumptions, with no corresponding increase in the deficit. This would close almost half of the growth gap between our postrecession recovery and the late-20th-century norm. And if some of those immigrants or their children turned out to be the next Steve Jobs or Elon Musk, we might solve our productivity woes, too. Immigration is as close to a free lunch as there is for America. Our welcoming culture provides us an unfair competitive advantage most countries would love to have. Let’s use that advantage to win the immigration competition and accelerate growth. We’d be crazy not to. Mr. Kashkari is the president and CEO of the Federal Reserve Bank of Minneapolis and participant in the Federal Open Market Committee. Gold is climbing as bond yields rise and the dollar falls, over speculation that China is pulling back on buying US Treasuries and Japan signals it is winding down its quantitative easing program. Meanwhile, US debt continues to grow after the Republicans under President Trump pushed a trillion dollars worth of tax cuts through the Senate, that the Congressional Budget Office thinks will add $1.7 trillion to the deficit over the next decade. It’s all good news for gold which thrives on the spectre of high government debt leading to more money-printing (aka the Federal Reserve buying Treasuries) and inflation. Today’s Federal Debt is $20,493,401,574,964.07. The amount is the gross outstanding debt issued by the United States Department of the Treasury since 1790 and reported here. But, it doesn’t include state and local debt. And, it doesn’t include so-called “agency debt. Federal Debt per person is about $62,805. Inflation, of course, diminishes the value of the currency and hikes gold prices, since the US dollar and gold normally move in opposite directions. Gold is seen as a hedge against inflation. Last week was very interesting for the bond markets which are a key determinant of the US dollar and therefore gold prices. On Friday, January 12, spot gold hit $1,337.40, having enjoyed a three-day run of $21.40 following an announcement from the Chinese that they could either slow or halt their purchase of US Treasuries. China holds $1.3 trillion worth of US debt, the most of any country. The Chinese buy Treasuries - effectively lending money to the US government - so that the US can keep buying Chinese goods and China can keep selling their products, earning enough dollars to convert into Chinese yuan to pay workers and suppliers. The People’s Bank of China buys US dollars from exporters, accumulating large forex reserves, and sells them yuan, to keep the dollar higher against the yuan. This gives China a competitive trade advantage. From November 2016 to November 2017 China’s trade surplus with the US was $416 billion, with the bulk of those earnings in US dollars, South China Morning Post pointed out in an editorial on Monday. Exports rose 10.9% in December. Whether or not the Chinese follow through (officials later denied the rumour), bond investors got spooked at the prospect of the world’s largest T-bill holder losing faith in US debt, and by extension, the US economy. A large selloff ensued, with the 10-year US Treasury bill hitting its highest yield in 10 months at 2.59% (bond prices and yields are inversely related: when prices drop, yields go up). The move up was also influenced by the Bank of Japan, which on Jan. 9 trimmed its purchases of Japanese bonds by about $20 billion. The Japanese cutback fueled speculation that the BOJ would end quantitative easing, just as the Federal Reserve did last September; the yen rose immediately by half a percent, as did Japanese bond yields. While rising bond yields are typically bad for gold, since they increase the opportunity cost of owning gold which pays no income for holding the metal, the present lift in gold prices, even though bond yields are rising, means the correlation is weaker than normal, according to analysts quoted by Kitco. The head of commodity strategy at TD Securities said that gold is benefiting from uncertainty given that the US dollar is weaker as bond yields push higher. “This tells me that markets don’t have a lot of confidence in the U.S. at the moment,” [Bart Melek] told Kitco. Vince Lanci, founder of Echobay Partners, said that the fact that gold can rally in a higher bond environment is further proof that the yellow metal has entered a new phase of its bull market. “China buying or not buying Treasuries in the short term is not the big factor… the fact that gold rallied on it means the path of lesser resistance, for now, is up,” he said. Still, the fact that bond yields are rising is a strong signal to gold investors that: 1/ the demand for US Treasuries is falling and 2/ that the stage is being set for a higher inflationary environment which would mean higher interest rates and increased stock market volatility. According to a 2017 report from Bank of America Merrill Lynch, when gold prices and bond yields rise in tandem, the stock market tends to move the other way. The report notes both the stock market crashes of 1973 and Black Monday in 1987 were preceded by three quarters of rising bond yields and rising gold. That’s because when both investment vehicles rise, it signals higher inflation, and that leads to rises in interest rates, which are generally bad for stock markets. When stock markets fail, investors turn to more concrete safe havens Ie. gold. Coupling the current 10-year benchmark Treasury rise, with the fact that a slew of maturing government debt hit the market last week - $32 billion of 10- and 30-year US bonds were sold, along with 4 billion euros of German bonds - “bond King” Bill Gross declared a bear market for bonds. Data last Friday showed that US inflation is now above 2%, with most analysts believing that more rate hikes (an anticipated three more interest rate rises by the Fed this year) have been priced into the inflation rate. Rates could even go higher. In a Wall Street Journal article, Boston Fed President Eric Rosengren said he expected “more than three” rate hikes in 2018 because it wants to get ahead of inflation and not tighten too quickly. The rise in the two-year Treasury bill - the benchmark Treasury most sensitive to Federal Reserve rate hikes - pushed above 2% last week for the first time since the collapse of Lehman Brothers in 2008, the start of the financial crisis. The two-year note now provides more income than dividends on the S&P 500 Index. Could this be the harbinger of the next stock market crash? The “big losses” Powell refers to “down the road”, which is actually now, is the extra interest the US government will be forced to pay on its Treasury bills, as the yield curve continues to climb. This will start a vicious cycle that goes something like this: Higher interest rates boost the cost of borrowing for businesses and individuals, thereby slowing the economy. This necessitates more government borrowing, thus pushing up the debt to GDP ratio which makes US T-bills more risky and less attractive to investors. If demand for Treasuries drops, so will the dollar, meaning foreign bond holders get paid in US dollars that are worth less, further slowing demand for them. Finally, as the dollar continues to fall, the US government will have to pay exorbitant amounts of interest on the Treasuries upon maturity, increasing its risk of defaulting on the loans once they become due. From this brief analysis, it’s easy to see that debt is good for gold. Bullion investors don’t have to worry about the government defaulting on the piece of government debt they own, nor should they be concerned about the value of the currency falling when the T-bill plus interest matures. As long as the gold is in the form of physical metal bullion it’s a safer bet than a T-bill. In a recent post I wrote about how China is hoping to reduce the hegemony of the US dollar, which most commodities are priced in, through the launch of a new oil futures contract. The yuan-denominated oil futures will allow exporters like Russia and Iran to buy and sell their oil through China, thus avoiding US economic sanctions and circumventing the US dollar. Moreover, the yuan will be fully convertible into gold on exchanges in Shanghai and Hong Kong. This is just the latest move on behalf of China to usurp the economic might of the United States. Between them, Russia and China are moving to kill the dollar. If that ever happens, it will make US-Chinese military conflicts in the South China Sea look like petty squabbles. At the end of 2015 the Russian Central Bank made the yuan an official reserve currency, and in 2017, the RCB opened its first office in Beijing. The closer cooperation was a result of US sanctions on Russia after the crisis in the Ukraine, and the oil price slump that hit the Russian economy. The two countries have also issued government bonds denominated in each other’s currencies, which are designed to compete with US Treasuries. Since then trade between Russia and China has been increasing, following in the footsteps of landmark energy deals that have taken place over the last decade. These include the $456 billion gas deal that Russian state-owned Gazprom signed with China in 2014, a $25-billion oil swap agreement Russian oil giant Rosneft signed with Beijing in 2009, and a doubling of oil supplies from Rosneft to China in 2013, valued at $270 billion. Another interesting development is the joint trade in gold between China and Russia. The idea is to create a link between the two gold-trading hubs, Shanghai and Moscow, in order to facilitate more gold transactions. Sound familiar? What they’re talking about is the kind of monetary system that existed before the 20th century - when banks were constrained in their loans by how much gold was in their vaults. The US went off the gold standard in 1971, thereby severing the linkage between the world’s major currencies and gold. Soon afterward, the US dollar became the leading reserve currency. While President Trump under his “Make America Great Again” banner has pressured key trading partners including China, Canada and Mexico, the reality is that passing protectionist measures and ripping up existing trade agreements like NAFTA is likely to depress the dollar - further alienating foreign investors who would otherwise flock to the greenback, and hurting the US economy to boot. For example during NAFTA negotiations last fall, currency strategist Jens Norvig was asked what would happen should NAFTA fall apart. The result he said would not only be dramatic declines in the values of the Mexican peso and the Canadian dollar, but also appreciation of the yuan and the euro versus the dollar. “In fact, I think over the medium-term, [euro] and [Chinese yuan] would benefit from the U.S. “America First” policy, as it has to make the [dollar] a less attractive reserve currency,” CNBC quoted Nordvig saying. The benefactor, again, will be gold. Gold rose 12.5% in value last year, shaking off US rate hikes, the frenzied introduction of bitcoin, and record-setting highs on the Dow and S&P 500 exchanges. While some investors have exited the precious metals space to chase alternative realities, aka the crypto world, gold has been, and will continue to be, a solid investment especially during times of economic and political upheaval when the metal functions as a safe haven. Are there other basic, more fundamental reasons to buy gold? Well, read this excellent articlefrom Bloomberg, ‘Disastrous' deals sideline gold-mining M&A as metal rises’ posted on Mining.com. For those who follow economic trends, the latest turbulence in the bond markets is a pretty bullish signal for gold. While there will be daily fluctuations, the short term trend seems to be one of a sustained rally, especially if bond yields continue to rise and the dollar keeps slumping. The correlation between the bond markets, the dollar and gold is an important determinant of future gold prices. These relationships are something every gold investor should track, to determine ideal entry and extra points for both bullion and gold stocks. I have bond market trends on my radar screen, and due diligence, which I freely share, on exceptional quality gold exploration juniors on my to do list. Do you? If not, perhaps you should. LONDON – Cybersecurity is one of the defining challenges of the digital age. Everyone, from households to businesses to governments, has a stake in protecting our era’s most valuable commodity: data. The question is how that can be achieved. The scale of the challenge should not be underestimated. With attackers becoming increasingly nimble and innovative, armed with an increasingly diverse array of weapons, cyber-attacks are happening at a faster pace and with greater sophistication than ever before. The security team of my company, BT, a network operator and Internet service provider, detects 100,000 malware samples every day – that’s more than one per second. Creative thinking among cyber attackers demands creative thinking among those of us fending them off. Here, the first step is ensuring that there are enough talented and trained individuals engaged in the fight. After all, according to a recent survey by the International Data Corporation, 97% of organizations have concerns about their security skills. By 2022, another study estimates, there will be 1.8 million vacant cybersecurity jobs. Amid this critical shortage of security specialists, it is imperative that we develop new approaches to attracting, educating, and retaining talented individuals, in order to create a deep pool of highly skilled cyber experts prepared to beat cybercriminals at their own game. The key to success is diversity of talents and perspectives. This includes neurological diversity, such as that represented by those with autism, Asperger syndrome, and attention-deficit disorder. People with Asperger syndrome or autism, for example, tend to think more literally and systematically, making them particularly adept at mathematics and pattern recognition – critical skills for cybersecurity. The problem is that neurologically exceptional people tend to be disadvantaged by the traditional interview process, which relies heavily on good verbal communication skills. As a result, such people often struggle to find employment, and even when they do find a job, their work environment may not be able to support them adequately. The United Kingdom’s National Autistic Society reports that just 16% of autistic adults in Britain have full-time paid employment, and only 32% have any kind of paid work, compared to 47% for disabled people and 80% for non-disabled people. This highlights the scale of the challenge faced by such candidates, as well as the vast untapped resource that they represent. Recognizing the potential of neurological diversity to contribute to strengthening cybersecurity, we at BT have reframed how we interact with candidates during interviews. We encourage them to talk about their interests, rather than expecting them simply to answer typical questions about their employment goals or to list their strengths and weaknesses. This approach has already been applied with great success by the likes of Microsoft, Amazon, and SAP in the areas of coding and software development, and by the UK’s GCHQ intelligence and security organization, one of the country’s biggest employers of autistic people. Of course, an updated approach to interviewing candidates will not work for everyone. But it is a start. More broadly, we must do more not just to expand the opportunities available to neurologically exceptional candidates, but also to ensure that these opportunities are well publicized. Delivering this change will require leadership by – and cooperation between – government and business. I am pleased to say that, on this front, BT is already taking a leading role, including by working with the British government on their Cyber Discovery program, a special initiative to attract schoolchildren into the cyber industry, and through our own apprenticeship programs. In the digital age, neuro-diversity should be viewed as a competitive advantage, not a hindrance. We now have a chance to invest in talented people who are often left behind when it comes to work, benefiting them, business, and society as a whole. By recognizing and developing the skills of this widely overlooked talent pool, we can address a critical skills shortage in our economies and enhance our ability to fight cybercrime. Such opportunities are not to be missed. Gavin Patterson is CEO at BT Group.